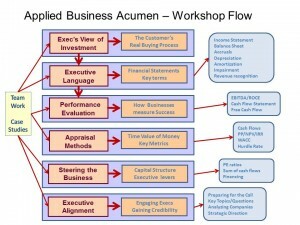 What Business Acumen do Sales People Need? The Sales Transformation program has been awarded the Best Training Award by a prestigious industry body. The program combines sales skills, solution selling and tools usage in the real customer environment by working on actual customer/prospect accounts. The work is sustained by the sales managers coaching their sales people on these accounts and opportunities. This approach ensures that the training is relevant, measurable and delivers value in the real working environment. In the first six months of the roll out, a revenue increase of 15% has been measured as directly attributable to the training. Do you want a training program that really drives business results? If you were asked to design a 2-day workshop to cover business acumen, the question for you is “How would you allocate the time between each of the above subjects and also ensure that behavioural change happens back in the real world?” This was the challenge that a large software company recently gave to me and they were especially keen, and quite rightly, to focus on applying Business Acumen with their real customers. How do we give them all the knowledge and skills they need while ensuring that they change their behaviour in front of customers. From previous posts, you will know that I am a keen advocate of the sales manager as coach being the ley reason that any sales person changes their behaviour in the long term (so I won’t re-iterate my thoughts here). As I created my initial design ideas, I spoke to a friend who had been through the excellent 2 year IBM sales school, and he suggested that the major issue today was a lack of knowledge around business and how businesses actually operate. 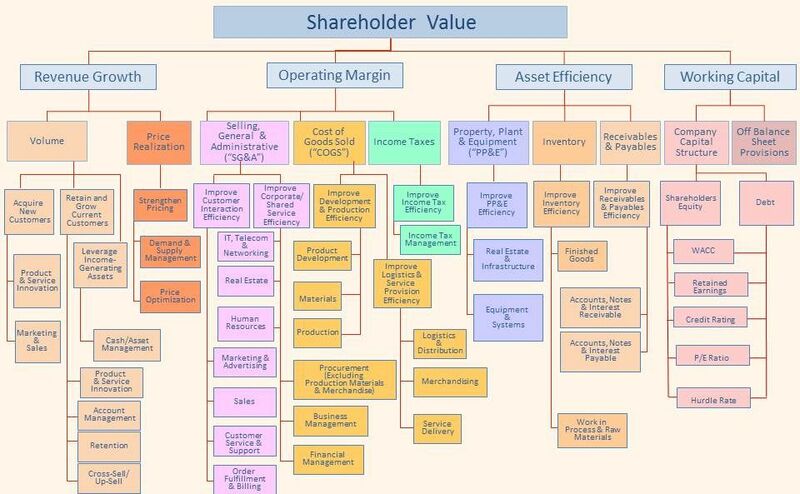 This led me down the well-trodden path of most Business Acumen courses and my first design looked very much like finance for non-financial managers – with a focus on the financial statements in the accounts. This is the trap of most Business Acumen courses and why they often end up being led by an ex-accountant who says things like “Now we are going to take a set of transactions and create the income statement and balance sheet, remembering that credits are negative and debits are positive, etc.” And you may like to consider what sales people going on such a course do afterwards? But the key question is “What does a sales person actually need to do their job?” Once you start to strip away the unnecessary jargon and get to the key points that sales need to grasp the whole knowledge transfer becomes easier. Having enough financial acumen to be able to read key parts of the accounts, for instance the CEO’s strategy and the risk analysis for their business moving forward, are essential to having valuable business discussions with executives. From there we can think about the customer’s buying process and how they evaluate your offer, not only against the competition, but also against other potential purchases in other areas of the business, sometimes known as the competition for capital. How do they measure success, how does the business measure the ROI of any potential investment, do they prefer capital purchases or revenue payments, is off-balance sheet important to them? It’s very satisfying to take sales people without this knowledge and take them through the learning process that allows them to come up with new ideas on how to position themselves as offering true value to their customers. At the end of day 2 they consolidate the work they have been doing in teams and present to all the sales managers around a new way of engaging with the executives in one of their customers. This becomes part of their coaching development plan and is a great starting point for coaching conversations with their sales managers. The learning I took away from this design was to go back to asking basic questions around what sales people need to know to do their jobs rather than trying to make them accountants. I speak to many Heads of Sales and Sales Managers and ask the question “What is it that your sales people are missing that would make them much more effective?” It may not surprise you to find out that they never answer a CRM system! Most of them talk about knowing more about a customer’s business, more understanding of how business works and being able to hold a discussion with an executive about their business issues – what I would call Business Acumen. 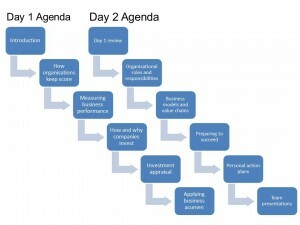 Most sales training today seems to be focused on either processes/tools (CRM, pipeline management, forecasting, etc.) or specific skills (negotiation, closing, etc. ), and totally avoids the big one – how do we give our sales people the knowledge to go and have these crucial executive conversations. Obviously courses do exist covering these areas but they tend towards finance for non-financial people rather than focusing on what sales really need to know and how they can apply it in real customer situations. This was the task that I was recently set by a global software company, how do we give our sales people the fundamental business knowledge and the skills to have executive discussions while allowing them to adapt their approach to create long-term behavioural change. The truth is that most sales people are scarred to have these conversations because their lack of business acumen may be exposed. However, if we go back to the Heads of Sales, they would say that these types of discussion are absolutely crucial to move their businesses forward. In the next article I will look at the design approach to the Business Acumen workshop and how the customer challenged me to change the way I thought about these issues. Those of you who follow my work will know that as well as working with my own clients I am a facilitator for CEB’s Challenger program and the various associated workshops for sales managers. Many of you will have seen lots written about The Challenger model and so I thought I would give my perspective on it. Let me say at the outset that the whole program really resonates with my sales and management experience and when compared to other programs that I have run I feel the potential for behavioural change is much greater. 1. The research. CEB are a top research and advisory organization answering the big questions that their members (customers) ask them, so the research is of high quality and conducted on significant sample sizes. CEB studied 10,000 customers asking 50 questions together with 25,000 sales people asking 44 questions. These sample sizes give datasets of 500,000 and 1,100,000 that are somewhat more significant than those of some of the counter arguments I have read with customer sample sizes of just 700. 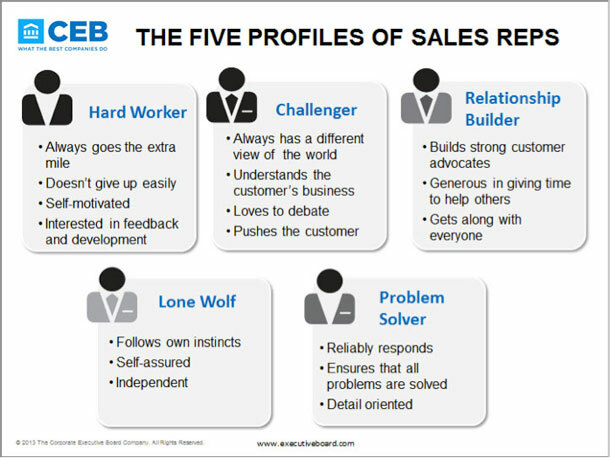 The other interesting point that many people fail to realise is that CEB didn’t create the 5 sales profiles (Challenger, Relationship Builder, Hard Worker, Problem Solver and Lone Wolf) rather these were derived from the data using factor analysis. So CEB weren’t looking for 5 profile types, the data led them to that result. Interesting, when this is compared to some sales methodologies, that start with the number of profiles they want and then build the “data” around them. 2. Intuition. Challenger feels right to me as a sales professional. I have always had a nagging doubt about the Relationship Builder bending over backwards to satisfy every whim of the customer. Challengers build relationships but go further, using constructive tension to drive action. This approach of Challenging the customer’s status quo and assumptions is what customers want from sales professionals today – teach me about me, tell me what I am missing, what best practices have I failed to implement? Sales people with no experience of truly working in partnership with customers and pushing back against their requests can find this approach eye-opening. 3. The results. I have always been an advocate of working on live customers in training workshops. In Challenger workshops, participants are challenged to think differently about their customers, starting from a business perspective and then moving towards their solutions. This approach stretches the sales people to learn more about the customer’s environment and deliver business value and only in the last step introduce their solution. The outputs from the workshop are action plans for key customers that can be implemented straight away and developed through coaching conversations with their managers. Some of the results have been truly stunning, and I particularly like the innovative ways that participants have developed to challenge the RFI/RFP process. Yes, even challenging Government departments to think differently and rewrite the tenders to take into account the Challenger’s ideas. 4. On-going transformation. Today, the Challenger model comprises skills, behaviours and organisational support that can be introduced into most companies and can sit across sales methodologies. New CEB research is answering the next question that Heads of Sales are asking “Is there a set of customers we should be targeting who are more likely to mobilize to drive action on our behalf?” – this is the Mobilizer research and in its own way just as powerful as Challenger. For anyone who is working in sales this research answers the key qualification question around where I spend my time – tell me who to talk to and who to avoid. For me, the most fascinating insight from the research is that most sales people are avoiding the very customers who can internally drive the action necessary to win the business. 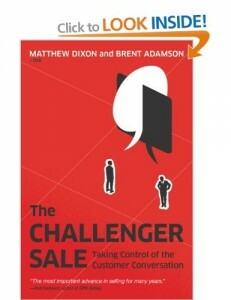 For more details on the Challenger approach, and for anyone interested in selling, I highly recommend The Challenger Sale: Taking Control of the Customer Conversation by Matthew Dixon and Brent Adamson. Books that are research based can be very dry, but this is both informative and a good read. As usual please let me know what you think. I have recently been asked by a prospect if I can create sales training based on competences for specific levels of sales people. In fact, I have done this a number of times for large global companies, but I have never documented the actual approach and methodology I followed in designing, developing and implementing this training curriculum. So the aim of this article is to document the generic approach I would initially suggest prior to the customisation for the specific customer requirements. 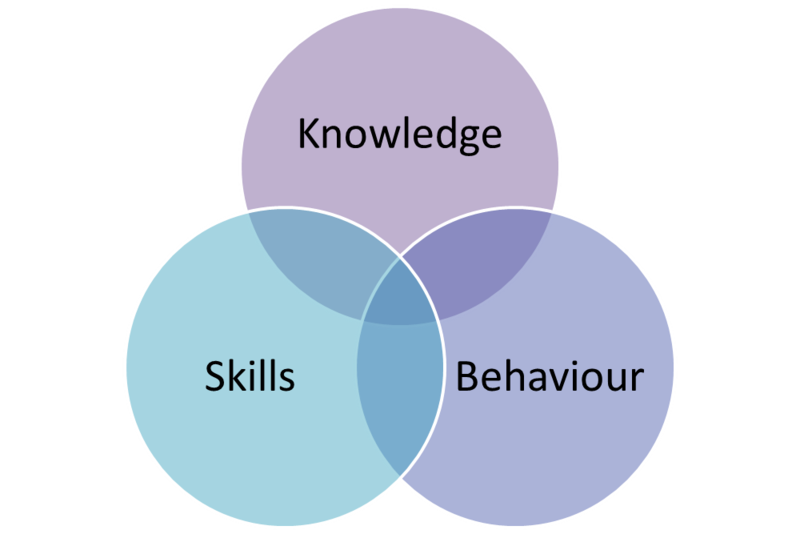 So what are the steps in creating sales training based around a competency framework? Step 1. Understand and document the sales organisational structure including the roles and responsibilities of all the roles in the sales force. This is so obvious, but in my experience creates a large amount of discussion and work in the client company to standardise on a number of defines sales roles and levels in each role. For instance you may have internal sales people selling B2B to SMEs and create three levels who are assigned to bronze, silver and gold accounts. The accounts are defined by their spend, or potential spend, and generally a sales person would have 200 bronze accounts, 80 silver accounts or 20 gold accounts reflecting the greater opportunities in the gold accounts. This process is replicated for all the various selling groups. Step 2. Understand what best in class sales people look like in each of the groups. The best starting point is a generic set of sales competences that can then be refined by observing sales people, interviewing sales managers and sales people, and understanding to sales process model for the specific roles. The sales process model is an important part of the design because your sales people will be expected to execute their sales plans against the model to drive consistent and repeatable business. Step 3. From the above you can then create a competency framework of, say, 6 to 10 key competences that are appropriate across some of all of the roles. So, building customer rapport is something that all sales people need to do, but business acumen probably isn’t a key competency for B2C sales people. 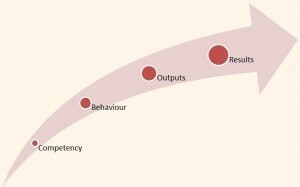 We must ensure that each competency is measurable and that we can identify levels of competency that are appropriate for the various levels of role. Ask the question “what does good look like for this competency and how would this be demonstrated by a sales person?” This is a very important point, any competency that we choose most be measurable in the customer’s business environment. 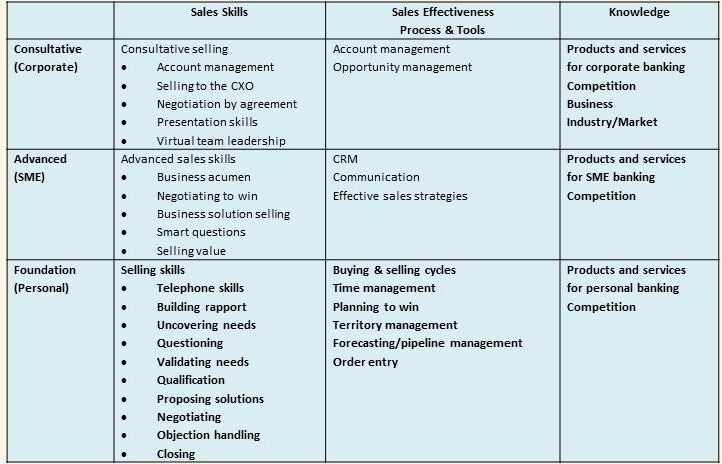 As an example 7 functional Sales competencies could be Selling Skills, Customer & Industry Knowledge, Business Acumen, Sales Process and Tools, Products & Services Knowledge, Planning & Organizing, Teamwork, Customer Support, and each of those 7 competencies could have 4 levels. Ask your colleagues and your manager questions about the business and the organization. You will increase your knowledge of operations and general business issues. Read the business section of your daily paper regularly. This will help you become more familiar with ongoing business issues. When reading memos or internal documents, underline or highlight business terms that are unfamiliar to you. Take the time to look these terms up in a dictionary or ask someone to explain them to you. You will soon become more knowledgeable about general business principles. Step 4. Now we have a set of competencies and levels for each sales role, which is the competency framework for that role, we can now assess each member of the sales team against the framework. The assessment can be carried out online, by management observation or by full assessment centres. If time and budget allow, assessment centres are a great way to benchmark a sales person’s current competencies. 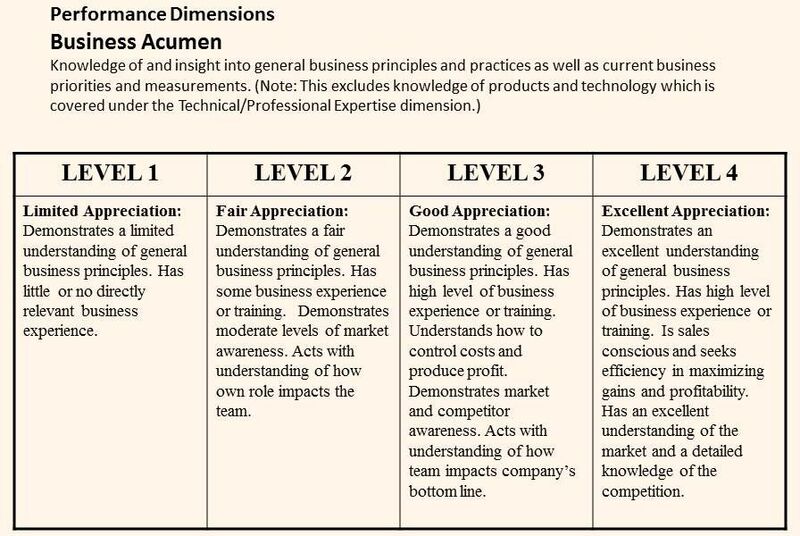 This leads to an understanding of where the sales person is today against the defined levels for each competency, as detailed against their specific role and level – hence the reason step 1 is so important. Step 5. This gives us an individual GAP analysis for each sales person that then allows for the creation of a personal development plan to close the GAPs, and also show what needs to be accomplished to move to the next level. The development plan may not lead directly to traditional training in the classroom but could be shadowing a best in class sales peer, or some of the activities described above for level 1 Business Acumen. Step 6. The competency framework also allows us to create training programs or modules that map to the competencies. Generally, most companies have a base-line sales training program that everyone is expected to attend, and this is often used as part of the induction process for new hires to the sales function in the company. Each training course will have a course aim, for example for the base-line training: To enable delegates to understand the basics of telephone/face-to-face selling and building customer relationships. The course will help them to become personally more successful in their sales role. The program is suitable for people who are relatively new to selling, as well as more experienced people who wish to refresh their basic skills. Develop an effective Value Proposition for different customer types and situations. 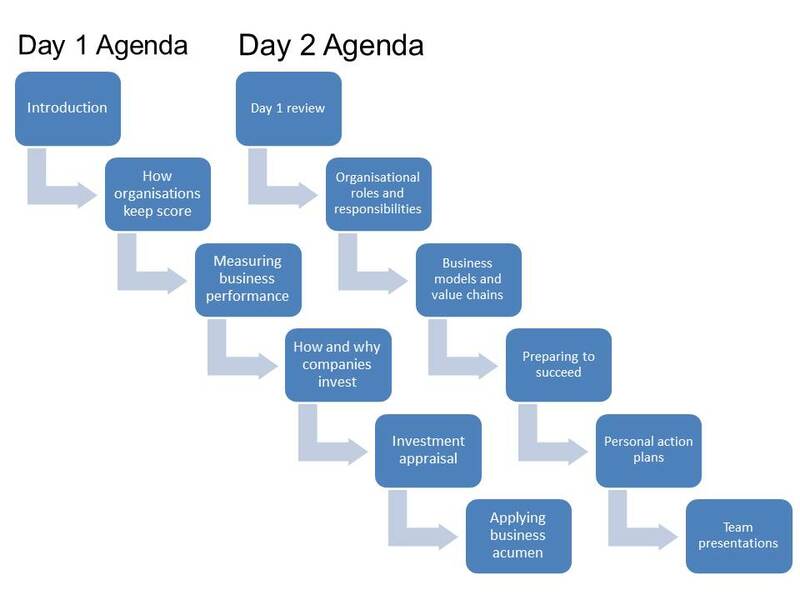 A half day module for planning could have the following agenda: From this point the training developer can easily create good interactive content for the customer based on the objectives and the flow of the agenda. The training needs to be measurable with some pre and post course / training assessments to both monitor the effectiveness of the training and to ascertain how the individual is developing. This is key to ensure that there is a real ROI from the program. “Catch a man a fish, feed him for a day. Teach him how to fish and feed him for life” – unknown. Of all the tools available to a sales manager to drive the performance of individuals in their team, coaching has been shown to be the most important in terms of achieving business results. Studies show that the optimum amount of coaching for an individual is 3 hours per month and that this has a dramatic effect on their business performance. Unfortunately, coaching is often the first activity that gets cancelled when the blizzard of requests for a sales manager’s time hits their desk. Once the coaching session and longer term development of the sales person is postponed, we fall back to the same old management using the order entry numbers, rather than analysing the problems earlier in the pipeline and using coaching to develop the sales person’s skill set. In our analysis of sales management behaviours, coaching is the activity that is most misunderstood and although coaching is often claimed, it is rarely seen. If “coaching” sessions are actually observed, the sales manager at worst tends to be very directive (confusing coaching with telling) and at best seems to be using clever persuasion to get the sales person to adopt their point of view. Very little coaching that is open and non-directive is observed. The real problem with coaching is that it takes more time and is harder than just telling. It is also mainly effective in the medium to long term, so when the heat is on for numbers at the quarter’s end, coaching isn’t the tool of choice for closing business. However, if good coaching is embedded and has been practiced earlier in the quarter then the mad dash at quarter end may be avoided or at least be more controlled. Coaching is often seen as “fluffy” but it can actually be very effective when used in business performance issues. When you are diagnosing performance problems you need to look at two areas. The first is the sales person’s performance against the target, the second is the sales person’s performance against the key sales metrics that you need them to deliver. 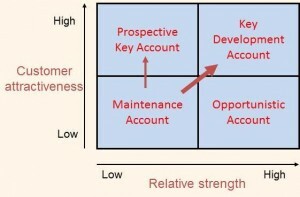 This diagram shows a formula which represents sales person’s revenue. That is the number of opportunities that we need them to bring into the pipeline, the average size that we would like that opportunity to be and the close rate that we expect. This would be divided by the average sales cycle length or velocity we need them to achieve. Having done this we would need to assess the sales and execution behaviour and then analyze the root cause of the problem to ensure that we are focusing on the real performance issue. This is where coaching comes into it’s own, and allows the sales manager to work with the sales person to create a set of actions to drive future performance. Graphically a pipeline, often called a funnel, looks like the diagram shown here. It should contain all of the leads and prospects that you generate through marketing and business development activities. These will then convert into opportunities that your team are working on and track their progress through the sales stages. The pipeline takes on a funnel shape, usually narrowing from top to bottom, as opportunities move through the sales process. Leads enter at the top, some of them will ‘fall out’ and some of them will move to the next stage. 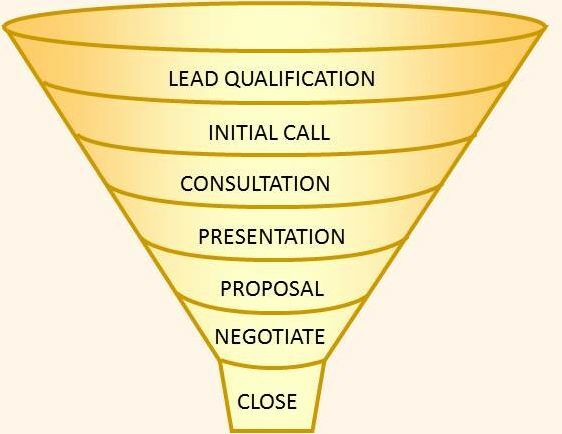 It is the reduction in opportunities that occurs as they move through the stages which creates the funnel shape. With the correct analysis of the pipeline, we should be able to see the conversion rate as the opportunities move through the sales stages and the average time taken for the deals to move to the next stage. Generally as sales managers we would take a granular approach to our team’s opportunities, tracking them as they move from one sales stage to the other. However, some sales people will demonstrate a consistently lower conversion rate between some stages, as compared with the rest of the team, and this is a great opportunity for a coaching conversation with the individual. 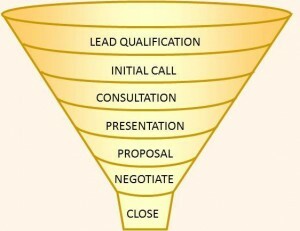 The starting point of the funnel is new leads coming in to the pipeline. It is vital that we understand how many new opportunities the team needs to generate each month to create an above target amount of closed orders. Furthermore, something that has a big effect on the number of opportunities is the size of the opportunities. If the team is generating small deals then we will need more opportunities; if they are generating bigger deals then we will need fewer opportunities. The next thing that we need to look at is the velocity with which opportunities move through the pipeline. If it takes one year for an opportunity to cycle through the pipeline, our pipeline will need to deliver target coverage at the beginning of the year. Again this is a good opportunity to coach individuals that have velocities that are slower than the team average between certain stages. Having determined the first three metrics (opportunity number, size and velocity), we need to calculate the ratios between the key stages in the pipeline, which tends to be company specific and based on how the sales process has been developed (and any CRM system parameters). These are very important metrics to calculate as it will determine the number of leads that we need to bring into the pipeline. So, again as sales managers we need to focus earlier in the sales process and ensure that the right things are being done early on, to ensure success. Obviously, when we get this information we need to work with individual sales people to enhance their skills in any development areas, and this is where coaching comes in. The span of control for first line sales managers can now be is high as 12 or 15 sales people, so the amount of joint customer calls is greatly reduced. So being able to control where the sales team are spending their time is key to making the team’s numbers. This is a massive topic, and absolutely key for a sales manager to get right. If the sales team are spending their time in the wrong places, with the wrong potential customers, how will you ever make your numbers? 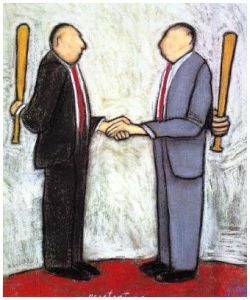 In some companies, accounts have already been divided up in some way e.g. 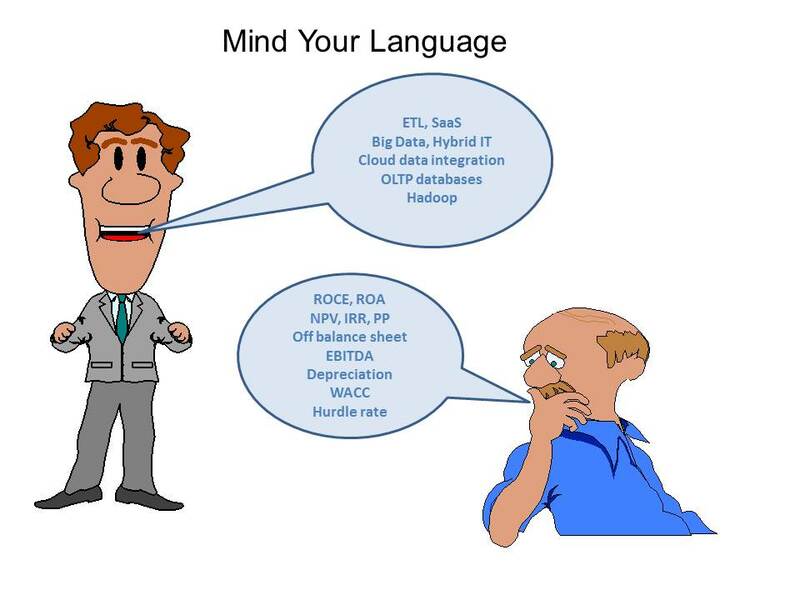 industry segment (IT, Oil & Gas), size (SOHO, SME, Enterprise) or geographical location, or a mixture of methods. As a sales manager, if this hasn’t already been done, you have a tremendous opportunity to shape where the sales force spends their time and get them to “Fish where the fish are”. But even if this work has been done at a high level, each sales person has been allocated 30/50/80/200 potential customers, so how many of those can they actually have a meaningful dialogue with? How many potential contact points are there in each account, how many people have authority to buy your products/solutions/services? The above example has customer attractiveness to us and the relative strength of our proposition, but there are many possibilities. These are the high level criteria you want to use to segment the accounts and understand where your sales team should be working. Obviously, you can change these and, in fact, the skill of this exercise is in getting these criteria right for your business. So, for instance, I could have chosen “value to us (now)” and “potential business” and this would affect the results we would get. The following table gives an example of factors you could include in “attractiveness to us”. As you refine this technique you may want to consider a number of sub-criteria for each axis, and to add more granularity you could weight each of the criteria relative to the others. Our suggestion is to use just 2 or 3 sub-criteria per axis so that the method doesn’t become too unwieldy. Again, we have found that running this as a facilitated workshop gives the best results, as an experienced facilitator who has used these models a number of times can get quickly to a reasonable set of criteria. 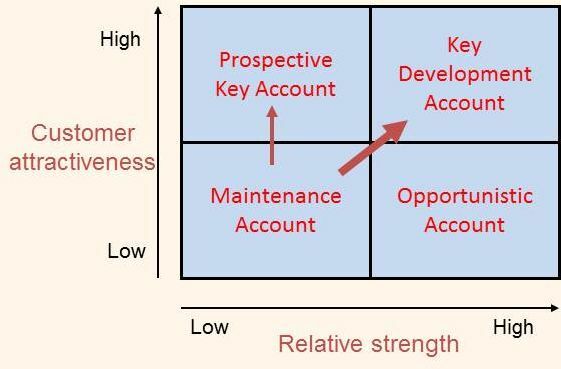 Finally, you will be able to map the accounts into the four quadrants and we can clearly see which accounts warrant our focus. This takes some time and effort but the rewards are massive. For a sales manager, or group of sales managers, to undertake this exercise is extremely worthwhile. Just consider the results of your whole sales force calling on worthwhile accounts, how much time is currently wasted on winning business you don’t want or chasing business you cannot win. So we have done some work in understanding our value to a customer and deciding which customer segments will yield the best results. The next part of the process is to manage the pipeline of potential business using metrics that focus on more than the order value. The first answer to the question “what can sales people do differently” is to educate their buyers, adding value by teaching them something they don’t already know. This approach takes time, skill and resource, but ultimately is the only way to differentiate themselves from the competition. To do this, sales people need to be able to create customer-specific value propositions, and this is where the sales manager comes in. 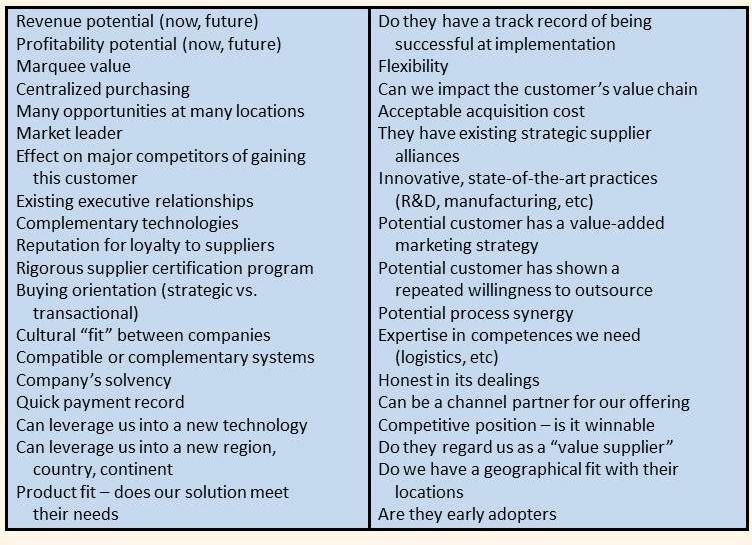 Let me start by saying that meaningful value propositions are meaningful to a specific customer and not the vague statements seen in general product/service/solution marketing collateral. Many inexperienced sales people take these vague statements and try and sell them to customers and claim fantastic ROIs from implementing their solutions. As we have already discussed, one of the changes in the buyer/seller relationship is that buyers do not want to be sold to by sales people. Rather, they want to be educated on developments in their specific industry segment that could help their businesses remain competitive. The difficulty is in how the sales person engages the customer without doing a detailed needs analysis, and this is where sales managers can help. 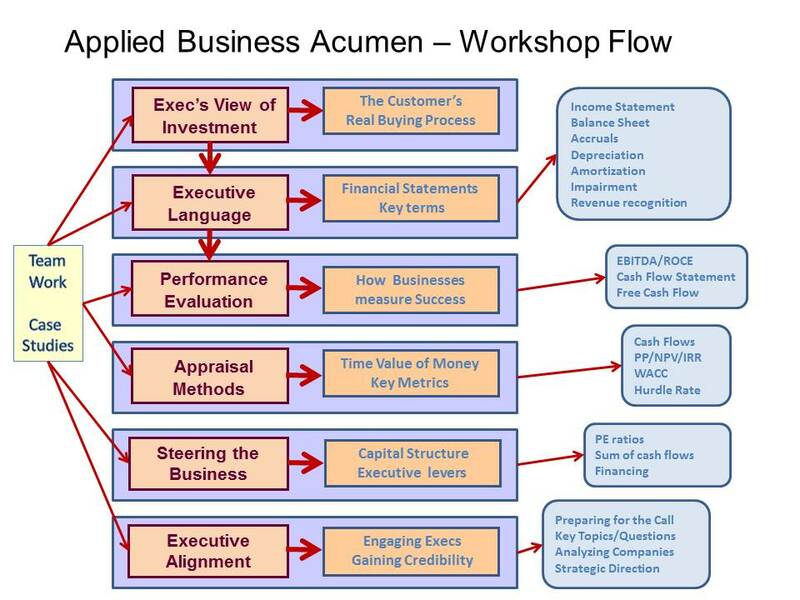 So how can we use business acumen to help develop value propositions? Firstly, we can reduce the complexity and get the sales managers to think about how their customers can increase shareholder value using the 4 levers that executives can “pull” to achieve this. These four levers are the four headings on the previous diagram namely: increasing revenues, reducing costs, sweating assets and providing working capital. It is important to consider the four areas as this is how a CEO/CFO will think about their business, too often sales people are one-dimensional and only talk about cost savings. The next phase is to start to segment your potential customers in terms of their specific industry or the problems they have in common with other customers (a more detailed view of segmentation is given later in the document). For example, we could focus on an industry segment – Telecommunications Operators – and think about some of their key objectives. In reality we are moving from right to left across the diagram whereas most selling companies move left to right. This means we always have our customer’s objectives at the forefront of our minds rather than our own product/solution/service. This allows us to clearly link their objectives to those four levers. The interesting part is then bridging between your solution and the industry objectives. 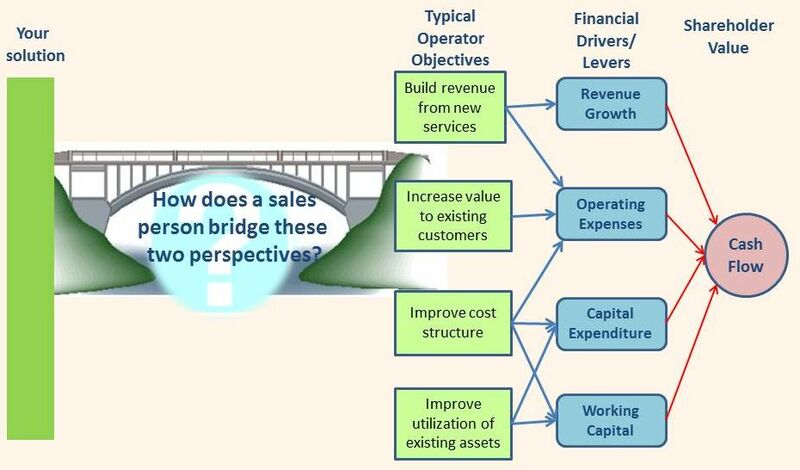 How we bridge the gap is normally achieved through a one or two day workshop of sales managers, senior sales people, customer facing technical people, product marketing and others who may have insight e.g. industry segment marketing. We recently ran this type of workshop for a large communications company. 30 cross-discipline people in the room divided into 5 teams of 6 people. Each team was given a specific solution sold by their company, together with a specific industry segment to work on. 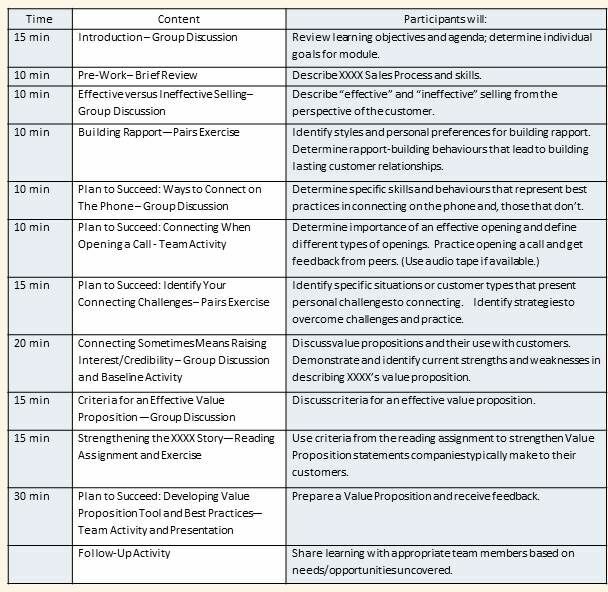 The exercise ran for about two hours and the outputs were outstanding – value propositions for five of their specific solutions for that industry segment. This gave their sales force an excellent starting point for educating their customers regarding specific industry benefits of their solutions and then going to the next stage of working with the customers own metrics to develop agreed ROIs. So, thinking as a sales person or sales manager, what would this approach do for your business? Think about how this would allow you to focus on a specific industry segment (Financial Services, Pharmaceuticals, etc.) with a consistent, value-based approach to potential customers. The next question is how we choose the segments, and the customers within the segments, that we should target. The starting point in the redefining of any customer facing activity should be the customer. So what has happened to the patterns of buyer behaviour that means we have to review the way we sell to customers? Original sales training was focused on getting sales people to fully understand the features and benefits of their own products, and be able to talk the customer through a presentation focused purely on their products. Even though this is seen as retro-selling many sales people, and their managers who were trained this way, still believe this is the way to make sales. The next generation of sales training focused on understanding the customer’s needs through a relentless Q&A session covering the customer’s current situation and delving into potential problems. These ideas have now been expanded to concentrate on getting the customer to understand the implications of their problems and driving action towards the sales person’s solution. What both these approaches fail to recognise is that the way customers (buyers) now want to engage with sales people has fundamentally changed. These changes are not a short term blip, but a longer term trend that makes both of the above approaches redundant. So what are these changes and why have they come about? This is a huge topic in its own right but needs to be identified here so that we understand the changes in the supplier/customer relationship and how that affects the role of the sales manager. As you work through them, think about the way you and your company now interact with sales people from your suppliers. Buyers have been fatigued by questioning, can you imagine 5 sales people from different companies coming in and do a thorough needs analysis. The internet allows buyers to thoroughly research any potential purchase and compare features, benefits and prices long before the sales person is involved. This phenomenon has led to an interesting corollary that for some purchases the buying cycle is actually reducing. However, in other purchasing scenarios, buying cycles are lengthening not only through economic uncertainty but also driven by a greater need for consensus across a number of buying influences. Buyers are much more savvy, many have attended buyer courses, and many have also been “burnt” by the promises of past sales people regarding how their solutions would transform their businesses. So how can sales people respond to this new buyer behaviour? What can they do to stand out from the crowd and add value to the buying process? What can sales managers do to help their sales people navigate this new reality? Times are tough, customers are delaying decisions, business is very competitive, customers are more purchasing savvy than at any time and they really don’t want to be sold to by sales people. But no-one told you that selling was easy! So what is the standard response from sales managers (VPs/Directors/managers) to this situation? 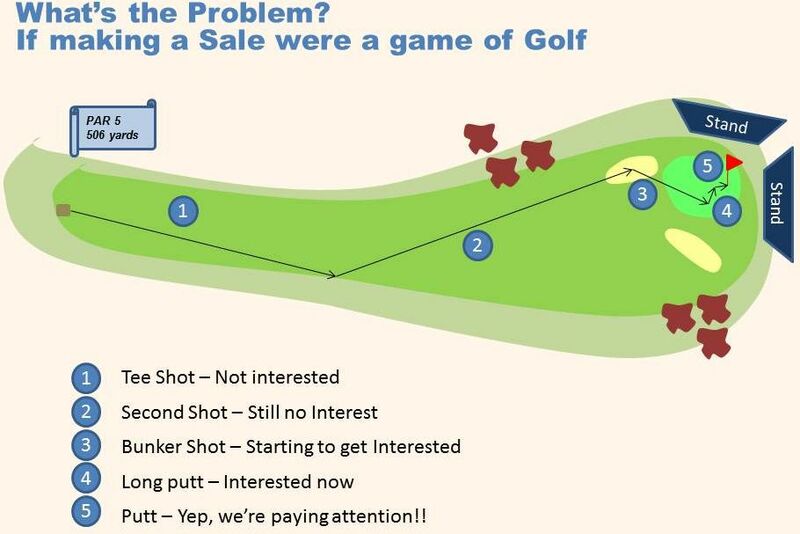 Unfortunately it is often to focus purely on the final outputs of the sales rather than the whole process, and a great analogy for this situation is golf. The sales person is on the tee, driver in hand and the sales manager is nowhere to be seen. The sales person can drive it straight (unlikely in my experience), slice it into the rough or pull it out of bounds. Whatever the outcome the sales manager probably has no idea what has taken place. They splash out to 18 feet and the sales manager is now standing over the putt with them giving advice and coaching using with phrases like “Remember, whatever you do don’t screw up!”. They putt to 3 feet, always a tricky one, and we notice the sales manager is now joined by their boss – great, the sales person is getting plenty of advice now. The good news is that they make the putt, the sales manager and their boss leave without a word, and the sales person goes to the next tee by themselves. OK, so it’s an analogy, but it works for me on a number of levels. Firstly, the sales managers only got involved in the dying moments of the sale and had little understanding of what has gone on in previous meetings with the customer. In fact, the first meeting may have been so bad that the sales person went out of bounds and never got a second shot. Secondly, we are focusing on outputs from previous work (the final putt) rather than shaping the business development efforts of the sales team by coming up with a clear set of practical strategies that can drive results. There are other parts to the analogy – and can you get it in the hole for quarter end – which I am sure you understand from your own personal experience, so I won’t labour the point. In the next post I am going to explore what hat has changed with buyers that should drive a change in both sales and management behaviour. I hope you enjoy the ideas. My background is sales and sales management in the IT industry. I have been designing, developing and delivering training for sales, sales managers and other senior management positions for 15 years. I also coach managers with a specific focus on performance improvement. My passion is about making a difference - can you drive real behavioural change through training, how do you sustain the change and how do you measure your success. Can we assist with your training requirements? Just email us now with your details and we'll get back to you.